Damien Robert received in 2006 his bachelor degree in chemistry from the “Haute Ecole Provinciale du Hainaut Occidental” (HEPHO), Ath, Belgium. He then entered the “Centre de Ressources Technologiques en Chimie” (CERTECH), in Seneffe, Belgium, to develop and characterize high throughput synthesis of catalysts for fabrication of polyethylene. 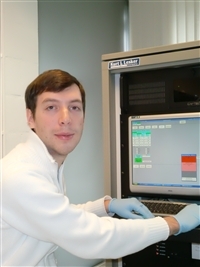 In 2007 he joined the Laboratory of Polymeric and Composite Materials (LMPC) of Prof. Philippe Dubois at Mons University (UMons), Mons, Belgium. His activity was mainly devoted to the characterization of chemical materials and systems within the scope of external provisions of services. He finally got appointed early 2008 to the Laboratory for Chemistry for Novel Materials (SCMN) of Prof. Roberto Lazzaroni (UMons), where he currently focuses on the fabrication and characterization of organic light emitting diodes for lighting applications to be incorporated within transparent supports. His work, essentially located at the Materia-Nova building imposes equivalent interactions with both the academic and industrial fields. As a technical expert, he is also in charge of the maintenance of the whole experimental organic electronics facilities at Materia-Nova.